Self-aggrandizement or science? Why not both? Victor Vescovo intends to go where no other man, or rich guy with his own submersible, has gone before: the deepest spot in each of the world’s oceans. 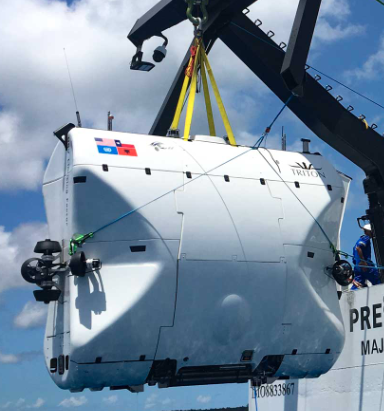 In late December he completed his first of five key solo dives, this one to the more than 27,000-foot bottom of the Atlantic Ocean’s Puerto Rico Trench. He also happens to be the first individual to have done this particular dive solo; in fact, only one other wealthy individual has ever gone deeper: Director James Cameron in his own sub Deepsea Challenger touched bottom in the Challenger Deep in the Pacific Ocean’s Mariana Trench back in 2012—the deepest spot in any of the world’s oceans at 36,070 feet or 6.8 miles below the surface. Sure, scientists and institution- or state-owned submersibles and remotely operated vehicles have been there and to each of the other four spots, but not a single, self-funded individual. Called Five Deeps Expedition, it’s the brainchild of Vescovo, co-founder and a managing partner of private equity firm, Insight Equity. His two-person submersible, Triton, can reach all five of the deepest spots in the oceans of the world. While many will argue Vescovo is just doing it because he can, he has employed academics and scientists (a team of 55 professionals are accompanying him on the expedition), and one of the goals of the project is creating cutting-edge, high-resolution 3D maps of these parts of the world’s largely unexplored oceans. His custom-built American-made Triton submersible cost $35 million and has the moniker Deep Submergence Vehicle Limiting Factor.